Our new home is 529 Bienville Street, between Decatur and Chartres, right in the heart of the historic French Quarter. 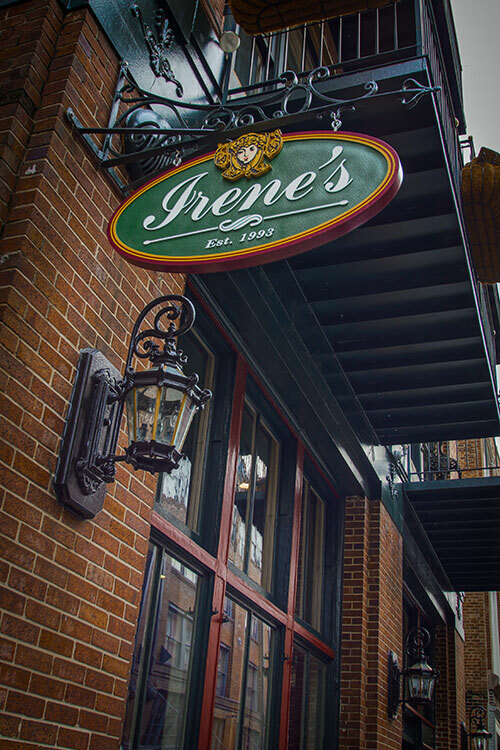 Once the French Quarter’s underground secret, Irene’s Cuisine has emerged over the years as one of the area’s most desired and endearing dining spots. At first, people spoke of it in whispers, as though it was just “our little secret” but then passers-by couldn’t miss the crowds waiting out in the street for tables, and certainly not the garlic and rosemary aromas wafting out into the street from the kitchen’s fans. Since its opening in 1993, Irene’s has remained one of the hottest tickets in town. How owner Irene DiPietro, a baby boomer from a little town in southern Sicily, came to dazzle the palates of the French Quarter’s jaded souls and create an enticing, enchanting setting that is both intimate and homey, is certainly fodder for dining out fanatics. You will feel like you are at home. "History along with great food and great atmosphere. We had dinner with friends and the place was buzzing. Our server was amazing. The food and wine was just spectacular." "The staff is always SUPER friendly and make you feel welcome and at home. The food. Oh EM Gee. It's comfort food for sure and it's DELICIOUS. Lots of house made secret sauces." "The best service, food, atmosphere that I have ever experienced. And get seated in Daniels section- he is the best server ever. Just go book now..."
"This place is now in my top 5 best New Orleans restaurants." "Service was great, food was damn near close to perfection in my opinion and the ambience was spot on." We recommend parking at the neighboring hotels, in the One Canal Place Lot or Premium Parking Lot - P402 at the intersection of Bienville and N. Peters. Copyright © 2018 Irene's. All rights reserved.